There are a multitude of UK House Price Indices out there. The last time we looked at the more common ones was here. Following some more data analysis work this month I feel as though we now have enough data and understanding to make this a regular feature. The best starting point is to firstly move away from the popular indices and get a visual look at the raw data as a picture tells a thousand words. The data is the actual sales of property in England and Wales for the month of October 2012 and comes courtesy of the Land Registry. I plot this data (shown in blue) as a histogram below. To help you see the changes that have occurred over the last month I also show last month’s data in red. The distortions caused by the government in the form of Stamp Duty Land Tax (SDLT) thresholds continue to be clearly visible at £125,000, £250,000 and £500,000. The other key observation is that the number of registered sales has risen from 64,173 in September to 74,934 in October. Note that the right hand bar is all house sales that are of a value greater than £600,000. The Rightmove House Price Index. It calculates its house price by simply taking the Arithmetic Mean or Average asking price of properties as they come onto the market. This means it will be affected by price changes, if the mix of house type changes and if the mix of location changes for houses coming onto the market. It is not seasonally adjusted and covers properties from England and Wales. Asking prices in October were £236,761 which month on month is a fall of 2.6% and year on year is an increase of 2.0%. There is no index of house sales price that is comparable to the Rightmove Index. To fix that problem I therefore present to you the Retirement Investing Today (RIT) Mean House Price Index. It is an index I have created which uses the raw Land Registry data as its basis, is not seasonally adjusted and covers properties from England and Wales. Sales prices in October were £241,877. This is now a very similar methodology to the Rightmove with the difference being the Rightmove uses asking prices and the RIT Mean uses sales prices. We can then compare directly if we time shift the Rightmove by 6 months (see below for rationale) resulting in a comparable Rightmove price for the period of £243,737. The Halifax House Price Index. This index is based on buying prices of houses where loan approvals are agreed by Halifax Bank of Scotland. It uses hedonic regression to remove type and mix variations thereby measuring the price of a standardised house. I use the non seasonally adjusted dataset and it covers the complete United Kingdom. Sales prices in November were £161,016 which month on month is an increase of 0.8% and year on year is a small rise of 0.1%. The Nationwide House Price Index. This index is very similar to that of the Halifax except it is based on buying prices of houses where loan approvals are agreed by Nationwide. Sales prices in October were £163,853 which month on month is a fall of 0.2% and year on year is a fall of 1.2%. The Land Registry House Price Index. This index uses repeat sales regression on houses which have been sold more than once to calculate an increase or decrease. As it analyses each house and compares the latest buying price to the previous buying price it is by definition mix adjusting its data also. This is then combined with a Geometric Mean price which was taken in April 2000 to calculate the index. It is seasonally adjusted and covers properties from England and Wales. It covers buyers using both cash and mortgages. Sales prices in October were £161,605 which month on month is a decrease of 0.3% and year on year is an increase of 1.1%. Let’s now introduce the second home grown index which is the RIT Geometric Mean House Price Index which also uses the raw Land Registry data as its basis. Also like the Land Registry back in April 2000 it uses the geometric mean to calculate its price except we calculate the geometric mean every month. It is not seasonally adjusted and covers properties from England and Wales. For October that price was £187,432. The third home grown index is the RIT Median House Price Index. It is simply the middle house sales price for the month of interest. For October 2012 that price was £181,500. 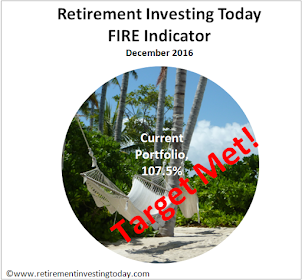 To better understand these indices we must remember there is a timing shift between the indices which we must also consider. Firstly, a house is placed on the market for the first time (the Rightmove Index). Secondly, somebody possibly buys the house using a mortgage (the Nationwide and Halifax Index). Finally, the purchase is registered with the Land Registry (the Land Registry, Academetrics and RIT Indices). The best estimate of this timing shift is shown in the chart within the paper by Robert Wood entitled A Comparison of UK Residential House Price Indices. The chart below then shows an overlay of all the indices. It uses the Land Registry/Academetrics/RIT house prices as the baseline date. 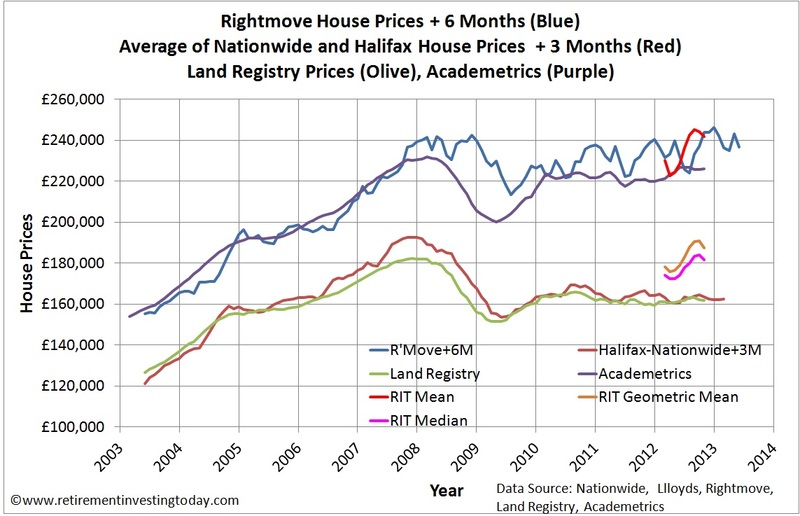 I then average the Nationwide and Halifax house prices in an attempt to increase the accuracy of these datasets as they are very similar and move the data forward by 3 months as that phase occurs 3 months before the Land Registry. I then also shift the Rightmove house prices forward 6 months as that phase occurs 6 months before the Land Registry. By doing this we should be able to fairly compare each of the indices with each other as we should be comparing the houses and prices from approximately the same period. Personally, I’m still out of the housing market as I believe house prices are still overvalued. 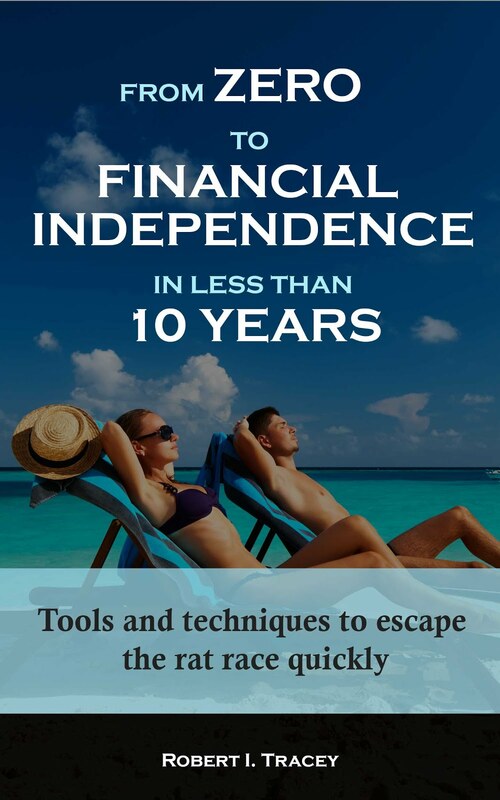 Instead I remain in modest rented accommodation, which along with the many other strategies I regularly communicate on Retirement Investing Today, allowed me to save 57% of my gross earnings (which included my employers small pension contribution) this month. Gosh, I'd forgotten stamp duty only kicked in at £125,000. Regional indices might be useful, to compensate for the distorting influence of London.